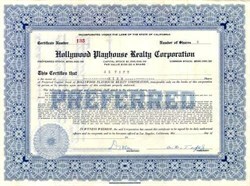 Beautifully engraved Certificate from the famous Hollywood Playhouse Realty Corporation from the 1920's. This historic document was printed by the Jeffries Banknote Company and has an ornate border around it. This item is hand signed by the company's president and secretary. The certificate is made out to and signed by A.Z. Taft as President.